Frankenstein or The Modern Prometheus ( illustrated ) book provides a reader with illustrations to interact with Mary Wollstonecraft (Godwin) Shelley fiction novel. The reader can appreciate the novel with striking illustrations. Cover illustration was inspired by artists for added interest the reader to know the end of the story. Cover illustration produced by illustration 8, "The monster swears revenge on all people" There are a few illustrations have been made to make this a really interesting novel. The editor also believe that illustrations can help reader develop critical thinking skills, as their brains take in the illustrations and the text and make connections between the two.When reader read books with illustrations, they are able to envision the story in a way that helps them relate to the characters. Illustrations also enable the reader to explore the world within their imagination and make connections between what they have just read and a visual image. When a reader connects what they have read with pictures, it can make the book more real to them. Illustrations are powerful ways of helping this novel come alive. NOTE: - The new structure of chapter headings in the novel. They are added here by the editor to assist the reader. - This Book follows the original text. - Illustrate produced using computer design After leaving Frankenstein's laboratory, the monster went to the village where he was insulted and attacked by the frightened villagers. He eventually went to the country and found refuge in a hovel next to small house inhabited by a old, blind man and his two children. By observing the family and by reading their books, the monster learnt how to speak and read. He felt compassion for the family, who had to struggle to get by, and anonymously did chores for them. Longing for some kindness and protection, he decided to meet his hosts. He got into a pleasant conversation with the blind man but his children returned unexpectedly. Horrified by his appearance, they beat him and he fled the house. Completely disillusioned, the monster was filled with rage and decided to find his creator. By chance he met Frankenstein's younger brother in the forest. As soon as he discovered that the boy "belongs to the enemy" he choked him. He also placed a portrait in the lap of a sleeping young girl, Justine, thereby incriminating her with his crime. The dæmon's only request from Frankenstein was that he should create another being: a female to accompany him. If Frankenstein complied, he and his bride would stay away from other people and keep to themselves in the wild. Frankenstein saw some justice in the monster's arguments and also felt that he had a duty towards his fellow-man, so he agreed to the dæmon's request. Victor left for England to finish his work accompanied by his friend Clerval, promising to marry Elizabeth on his return. When the work on his second creation was advanced, he started to question his promise. He was afraid that they might hate each other, or that they might produce a whole race of these creatures. When the monster visited to check on the progress, Frankenstein destroyed his work. The monster swore revenge and promised to be with him on his wedding night. The following day a body was found and Frankenstein was accused of murder. He was taken to the body, which he identified as Henry Clerval. He was eventually cleared of all charges and returned to Geneva in a very bad condition. Frankenstein married Elizabeth after promising her to tell her his horrifying secret the following day. Remembering the monster's threat, Frankenstein was convinced that he would be killed that night. The monster, however, killed Elizabeth instead. Frankenstein lost another family member as his father died after hearing the news about Elizabeth's death. Frankenstein had now lost every sensation except for revenge. 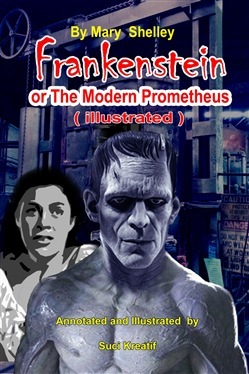 Acquista Frankenstein or The Modern Prometheus ( illustrated ) in Epub: dopo aver letto l’ebook Frankenstein or The Modern Prometheus ( illustrated ) di Mary Shelley ti invitiamo a lasciarci una Recensione qui sotto: sarà utile agli utenti che non abbiano ancora letto questo libro e che vogliano avere delle opinioni altrui. L’opinione su di un libro è molto soggettiva e per questo leggere eventuali recensioni negative non ci dovrà frenare dall’acquisto, anzi dovrà spingerci ad acquistare il libro in fretta per poter dire la nostra ed eventualmente smentire quanto commentato da altri, contribuendo ad arricchire più possibile i commenti e dare sempre più spunti di confronto al pubblico online.